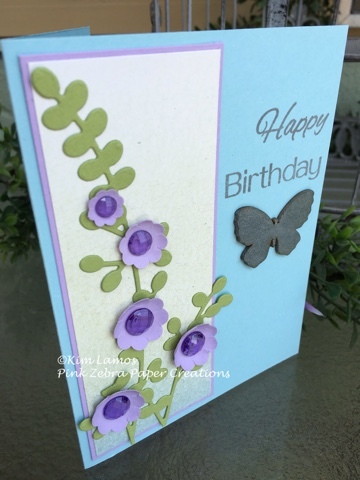 Today, I have another flower card using some new product from our Spring into Summer Catalog. The base of the card is Pool Play cardstock. I then matted a piece of the Summer Romance pattern paper with Pretty Amethyst Cardstock. I adhered this to the card on the left hand side. I then stamped the sentiment from Cake Time on the right hand side with River Stone ink. I die cut Bloom Cluster from Lemon Grass cardstock and adhered it to the card. I then used the punch, Summer Pretties and punched them from Pretty Amethyst Cardstock. I adhered them to the card and added Rainbow Drops to the middle of the flowers. To finish the card, I took one of the Summer Wings wood pieces (Current Bloom Benefit) and painted it with Silver Silk. When it was dry, I added it to the card with glue. Enjoy!